LibGuides gets updated on the regular. Even Springys get surprised and you'll sometimes hear in our virtual hallways, "I didn't know I could do that in LibGuides!" With so many new features and all that built-in functionality, we have a few quick tips to help you out that you might have missed the first time around. 1. LibApps Admins Can Do What? 1. Did You Know Your LibApps Admin Could This? Here's a brainteaser... your LibGuides admin may, or may not, be your LibApps Admin. Whoa, are you in the Matrix? Nope, although you would look killer in those leather duster coats. Let's break it down. LibApps is your institution's 'central hub' to all your other Springshare tools. Your LibGuides admin is the admin to that specific tool: LibGuides. Similarly, your LibAnswers admin is the admin for just LibAnswers. You may have the same administrator for all your Springy tools, or you might separate responsibilities. 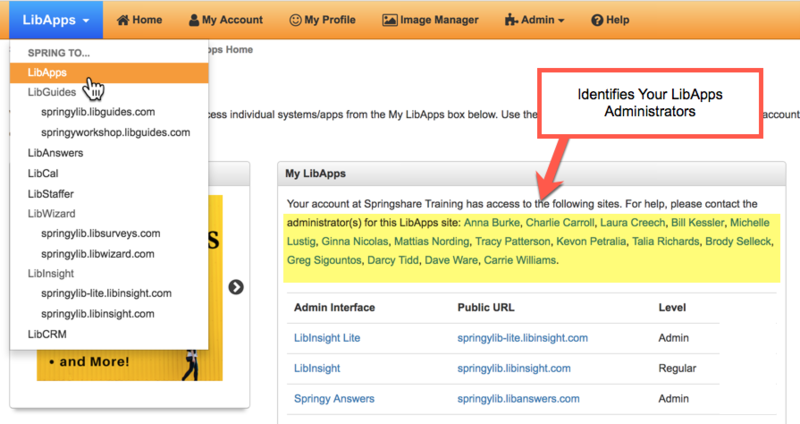 Your LibApps Admin is the administrator for the settings and functionality that span your Springshare package of tools. For example, setting up Twitter or Facebook integration, customizing the LTI Courseware Tool, or helping users reset their passwords. However, more often than not, your LibGuides admin can also be your LibApps Admin. This tip focuses on things that your LibApps Admin can do for you! How do I access the LibApps Dashboard? What can a LibApps Admin do? What can I do from the LibApps Dashboard? Where can I view which Springy Tools I have access to and at which permission level? Yes, you read that right! LibApps Admins can edit a user's name, email address, and/or password. Why would they need to do this? Account holder changed their email address / there's a typo - LibApps Admins can sign-in, view and/or edit the email address. Tip: You can also log in using the original / mistyped email address and update it yourself in LibApps > My Account. Account holder forgot password / password reset email is being blocked by email filters - If you're trying to reset your account password, and it's just not coming through because of email spam filters, your LibApps Admin can reset your password. Tip: For security, always reset it yourself after you've successfully logged-in with the password set by your LibApps Admin. Email Domain Changes - If you went from @springyuniversity.edu to @springshareuni.edu, your LibApps Admin can sign-in and edit everyone's email accounts to reflect the new domain. Tip: You can also login and update your own email account in LibApps > My Account. Unlike the one ring to bind them all, you can have multiple LibApps Admins. This is especially useful if your solo LibApps administrator takes a long service leave, leaves, or retires, and you delete their account...you will have also deleted your only LibApps Admin account. Uh oh, not good. It's always a good idea to have multiple LibApps Adminis - check our FAQ to see how you can add more. But did you also know that we've got your back to ensure that your site is always secure, whether we obtained your cert via Let's Encrypt or you uploaded your own? Certs expire - this is a good thing! It means that you have to regularly renew to prove that your domain is still trustworthy. But it does require you to remember to renew it...or does it? If you've uploaded your own certificate, we'll keep an eye on the expiration date and make sure you have a free Let's Encrypt certificate in place before it expires, to ensure continuity in service & security. You're welcome to update your own cert whenever you'd like, but we've got your back - just in case. If you're using a Let's Encrypt certificate already, the same applies! You didn't need to lift a finger to get one and you don't need to lift a finger for it to be renewed. If you're already enjoying a secure experience via certs & the "Force HTTPS" setting (the majority of you - wahoo! ), you can rest assured that your security will be uninterrupted by expired certs. And for those of you who have not yet made the leap - now you know! You already have a security certificate in place. You can easily make the jump to HTTPS-only by checking your system for unsecure content (see tip #5 below & check out that section of the Living in an HTTPS World blog post) and using the Force HTTPS option available for all of your sites. Rest easy, knowing we've got your back to ensure your site remains secure via automatic renewals of your security certificate. Perhaps your library subscribes to a discovery layer service like EBSCO EDS, Ex-Libris Summon, or Primo. 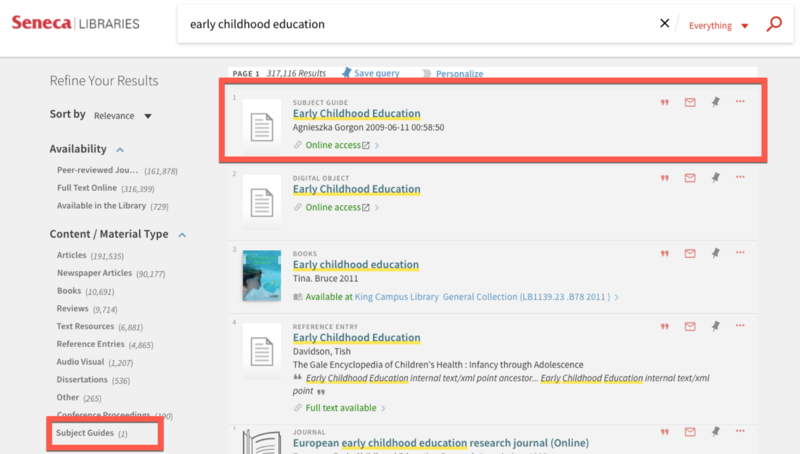 Did you know you can integrate LibGuides content into your discovery layer? Easy! Simply contact your EBSCO EDS support team and let them know which content you'd like to enable. Are You Using XML Integration? Before OAI-PMH, you had to integrate using XML exports. This required a periodic export each time you added new LibGuides content. Currently using XML? We strongly encourage you to switch to the OAI-PMH method. For every LibGuide you build, we automagically add Dublin Core fields to every LibGuide. At the guide level, this includes 10 Dublin Core Metadata tags. Using the OAI-PMH method, you can auto-retrieve your LibGuides content, in OAI format, for integration in Primo. LibGuides Databases A-Z: Add your Databases, maintained in LibGuides, as a material type. LibGuides E-Reserves: Integrate course reserves allowing students to search Primo and retrieve results on the instructor's name, course name, and course number. (E-Reserves Subscription Required). Adding LibGuides Discovery to Primo VE: https://developers.exlibrisgroup.com/blog/Adding-Springshare-Libguide-Discovery-to-Primo-VE. There are quite a few steps to this level of integration from creating pipes, running a normalizer, and more. We strongly recommend you sign-up for this training session to learn more. LibGuides display natively inside the search results and also as a material type filter. Using a Different Discovery Layer? Ask Their Support - Check with your discovery layer support team to see if they have native integrations with Springy Tools. OAI Integration - Check with your discovery layer support team if they have OAI integration, then follow their OAI integration instructions. 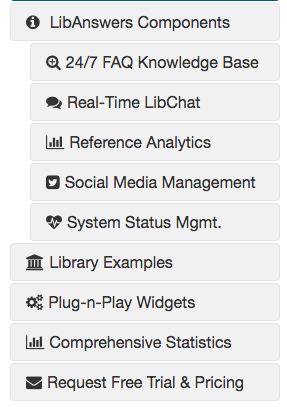 Did you know that LibGuides includes a full suite of icons? A great way to add visuals to your side-navigation, just like in this newsletter, is to 'call' these icons right in the page title. Font Awesome is a free suite of scalable vector icons that are easily customizable. Change the size, color, add a border, anything at all – using some really basic inline HTML. The Font Awesome library is fully incorporated into LibGuides! Simply call the icons using their CSS classes. Forget Photoshop - No need to worry about advanced image editing techniques. You Don't Need to Manage Licensing/Copyright - We include Font Awesome inside LibGuides; there's no need to purchase an icon library or maintain copyright. Only Need Beginner's Level HTML - Font Awesome is so easy to use, simply copy/paste the format below. Make a few small changes and you're golden! Current Font Awesome Library - As of the writing of this newsletter, August 2018, LibGuides currently utilizes Font Awesome library 4.7.0. We will be updating to the newest version of Font Awesome in the future. We'll announce it on our blog when we update to the newest version. Be advised - When we update to the newest font awesome library, some icons in their current 4.7.0 library might not be supported or might need to be updated. Font Awesome Icons Are Accessible (so long as you add the aria tags) - Font Awesome HTML examples includes built-in aria tags for screen readers. These tags tell screen readers to ignore the icon, perfect for those icons that are purely decorative - like those used in this example. Font Awesome Icons Can Be Customized Like Text - Adjust the size, color, etc. like you would any other piece of text, using font-style CSS. How Do I Call a Font Awesome Icon? Replace icon-name with the Font Awesome name: Add in the Font Awesome icon name directly from the library. Replace insert-padding with a number: Add padding, in pixels, to create space between your icon and your text. Will It Work With Tabbed Navigation? Absolutely - but visually, it looks better in a side-nav layout, so we don't recommend using it in tabbed nav. It's easy! When creating or editing a page title, add in your Font Awesome HTML (above) before the page title. Pro-Tip: Add padding-right to your HTML to add a bit of space to the right-side of your icon, as noted in the example. Editorial Note: This video was originally created in 2016. So while the concepts still apply, some of the items in the videos might be outdated. For example, the URL referenced at the 1:20 mark is not correct. Please reference the above URL at the writing of this newsletter, Aug 2018. If you haven't checked out the new assets filtering options, go ahead and take a look (Content > Assets). Don't worry, we'll wait for you! Really awesome right?! We know, we're amped too. For those of you who didn't go and look - we've added in-depth filtering to the assets page! This way you can slice and dice your assets, searching on URL, subject, owner, and type. Don't forget the colon at the end, or you'll get all http and https URLs! This will display a list of all widgets that are using HTTP URLs and not HTTPS. If you're forcing HTTPS access to your site, you'll need to edit/weed out these non-secure widgets to ensure a safe web experience for patrons.